In 2002 in the Mastership of Mrs Judith G Osborne, the Windsor Herald of the College of Arms designed the Guild badge – a quill and a sigma intertwined to represent the arts and the sciences (as the basis of knowledge) and the past and the future (as the foundation of understanding). This badge provided the repeated motif on the Guild ties which were then introduced. In September, the first Annual Service was held at St Olave’s Church (where Samuel Pepys and his wife are buried) by kind permission of the Rector, and the Select Preacher was, most appropriately, the first Honorary Chaplain to the Guild, the Rt. Revd. Peter Hullah BD, AKC. Thereafter, the Service has been held with a different Select Preacher each year and the Guild has developed its own order of service, with an aim of representing different denominations and faiths, as a thanksgiving for, and a re-dedication of, its resources and a memory of any Freemen who have died in the previous year. There is now a specific Guild Prayer and Hymn. The second Franklin Lecture was given by Dame Judith Mayhew DBE (a former Chairman of Policy and Resources of the Corporation of London) entitled ‘Globalisation, the Knowledge Economy, the Role of Business and Higher Education’. 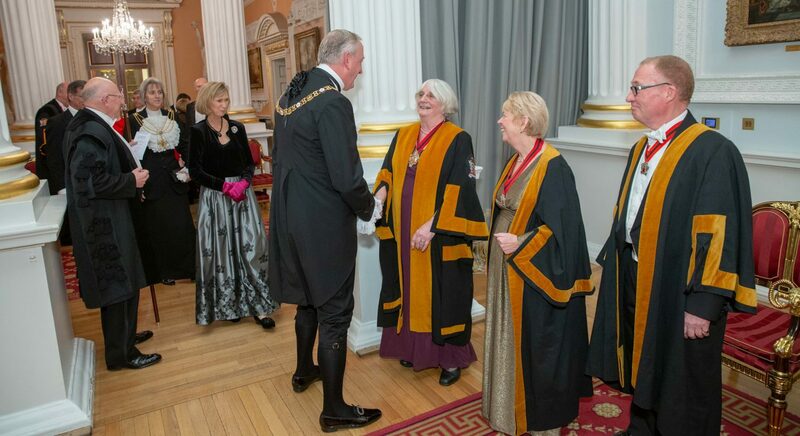 It was also in 2002 that the Master Baker (Mr Francis Bergin) approached the Guild to offer an arrangement whereby the Guild would use the Hall of the Bakers’ Company as its domus,holding its four statutory meetings there with the Company giving guidance and support. Thus, early in 2003, the second Election Court and the following Election Dinner became the first events to be held in the beautiful candle-lit Hall. The Guest of Honour was Mr Christopher Everett CBE (the Master of the Skinners’ Company and sometime Headmaster of Tonbridge School). This was also the occasion when the Guild’s first treasure, a Loving Cup, presented by Freeman Dr Patsy Marshall, was displayed.